The Soap Yard offers hand-crafted soaps made only with pure essential oils and natural ingredients like haldi, rose, lavender and neem. Launched in 2015, The Soap Yard was born out of cosmetologist Poonam Raheja’s passion for beauty and skincare products. With help from her daughter Malvika on the marketing side of things, the mother-daughter duo started a venture of their own from their house in Paschim Vihar. 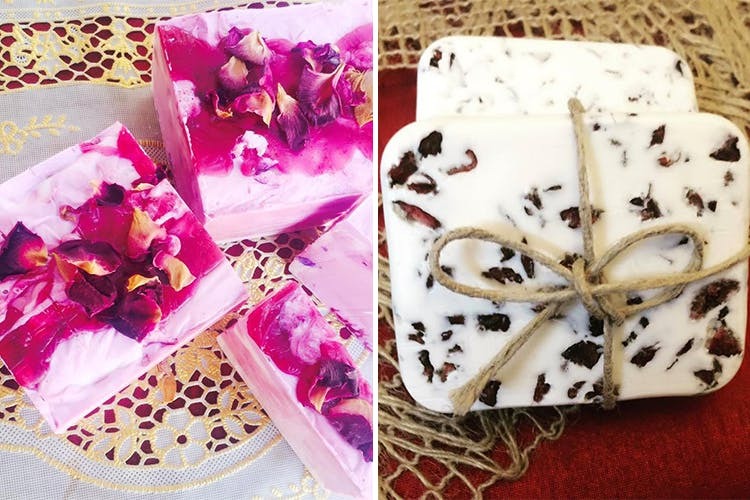 The Soap Yard currently offers melt & pour soaps that are 100% natural, and do not use any artificial fragrances. It means that, if you’re ordering their popular Neem & Lemon Soap, what you receive is neem and lemon—which is rich is vitamin C—along with essential oils and natural soap bases. So, give those chemicals a miss and choose from their range of exotic soaps like Haldi Badaam, Charcoal & Shea Butter, Red Chandan, Aqua Mint and more. The ingredients they use in their soaps range from gram flour and sandalwood to turmeric and rose—perfect if you've got acne, dark spots, or just generally dull skin. They can even customise soaps according to your skin type and according to the occasion too (for baby showers, travel pouches etc), so we say you go ahead and treat your skin to some natural goodness by The Soap Yard.